It finally snowed here in Utah and Brody was so excited to play in the snow so we invited his cousins over to play. They had fun playing and they built a snowman. Today Brody noticed that the snowman was starting to melt and it really intrigued him. I think he would have fun making these melted snowman cookies. They are pretty cute don't you think? 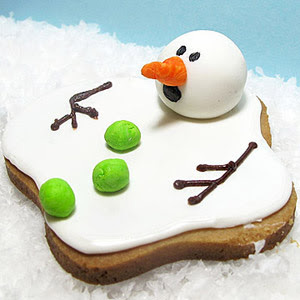 Have you made melted snowman cookies before? Oh, what a cute idea! We never got around to making gingerbread men at Christmas, so I like this idea for a fun January/winter activity. One could also substitute candy for the buttons, eyes, etc. I've never seen that idea, but it's darling!